Visit the ancient pagoda of Tay Phuong, carved from jack fruit wood. Climb mountainous passes and end your day in a traditional stilted guesthouse of a Thai ethnic minority family. See the rustic farming villages of the Hmoung and Thai people and check out Pa Co market. Drive the winding passes as you brush through the green tea plantation in Moc Chau. Take a trip to Son La, a prison the French kept the famous Vietnamese political prisoners. Make your way through the challenging Pha Din, known by locals as the place where the sky meets the earth. Cruising through Son La province pass, it’s another long ride with plenty of visits and stops for pictures and it offers both on-road and off-road motorbike trails. Take a trip down to Lai Chau and going up to the highest pass in the Northern region to get the best view of the Tram Ton – O Qui Ho pass – one of 4 longest and most beautiful passes in North Vietnam. Arrive in Sapa and choose either a hotel in town or do home stay with the Zay people in Ta Van village. 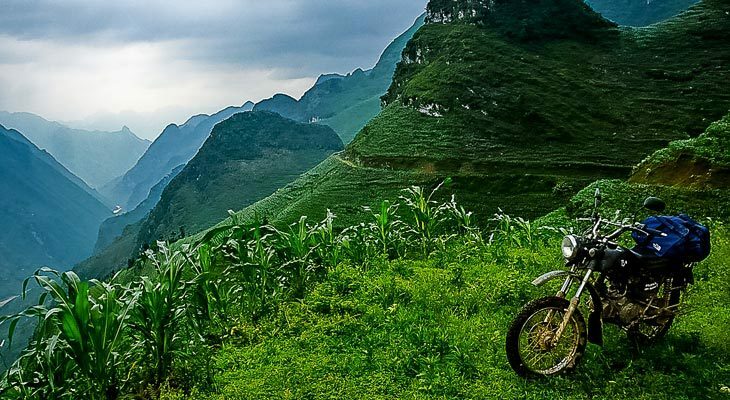 Spend your last day on a light trek in Sa Pa.
Departure from Ha Noi to Mai Chau for your motorbike trip at around 8:00 AM. It takes about an hour ride to get to closer to the countryside. The first visit is Tay Phuong pagoda, also known as Sung Phuc pagoda, consists of three single-level structures built in descending order on a hillock that is said to resemble a buffalo. Figures representing ‘the conditions of man’ are the pagoda’s most celebrated feature – carved from jackfruit wood, many date from the 18th century. The earliest construction dates from the 8th century. Leave the city behind and pass through craggy, mountainous landscape, get up a massive pass and end in the mountainous circus of Mai Chau. Lunch is served at a local restaurant in Hoa Binh. On arrival in the small remote village of Ban Lac arround 4pm, we’ll check in to the traditional guesthouse of a Thai ethnic minority family, wooden and on stilts. You have the choice of hiking or cycling around the green hills. Afterwards, we return for dinner and overnight in the stilt house with our friendly Thai hosts. It’s an easy motorbike ride to Son La, the ride in the morning is on the winding mountain passes, crossing many rustic villages of the Thai, Hmong people who plant a lot of corn, sugarcane and green tea instead of rice that make the mountain green all the you go by. On this day we will visit the Pa Co market, the small one that runs every Sunday in Pa Co village where local people, mostly H’Mong coming from the surrounding neighborhood to trade. Market starts early in the morning and finish a couple of hours before noon. Continue your joyful motorbike trip on the winding passes then we will have lunch and then join the smooth road to Son La. Don’t miss the beauty of green tea plantation in Moc Chau! Arrive the city about 4:00 pm, get off the bike then take a short walk to the Son La prison where the French kept the famous Vietnamese political prisoners. The visit help you to learn more about the Indochina war/French war when the North Vietnam take an important part for the French. This must be the highlight of the motorbike tour in Northern Vietnam. 3Day 3: Son La - Tuan Giao - Muong Lay: 170 km. Conquer the Pha Din pass is a dream of many people. According to a legend of the local, it is the place where the sky meets the earth. Long time ago, there existed a deputation on the border between Lai Chau and Son La provinces. It was solved by a horse-racing. Two horses started from each side of the pass and the border was determined at the point where they met each other. The horse of Lai Chau province ran faster than the one of Son La province so the pass belonging to Lai Chau is longer than that of Son La. It’s another long ride with plenty of visits and stops for pictures. 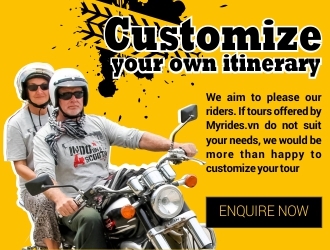 The ride today could be one of the greatest day of this Northern Vietnam motorbike tour, it offers both on-road and off-road motorbike ride, the view of mountain is changeable after each kilometer. We arrive the hotel in Muong Lay and finish the great motorbike riding day in North Vietnam in late afternoon. We keep enjoying the motorbike touring to Lai Chau. Right after the town, the trip along the Black river , enjoy the amazing view of the limestone mountain and river. On this day, we can take some visits to the villages of the Dao, Thai or the Lu people and if you come to the right day, you can see the colorful market of the local hill tribes at the town. After lunch in Sin Ho, continue the trip to get down to Lai Chau and going up to the highest pass in the Northern region; get the best view of the Tram Ton – O Qui Ho pass – one of 4 longest and most beautiful passes in North Vietnam. The great stop at the Silver water fall to have a short walk up to be closer to waterfall before continuing ride to sa Pa. We’ll arrive Sapa at the late afternoon. Stay at hotel in town or do home stay with the Zay people in Ta Van village. We will have an easy day in Sa Pa to have a light trek to the villages of black Hmong people, Dzay people and red Dzao people in Lao Chai – Ta Van and Giang ta Chai villages. Getting down to Lao Cai in the afternoon, have dinner in a local restaurant at Lao Cai station and take the night train back to Ha Noi. After a night sleep on train, arrive in Ha Noi at 5.00 am. End of the trip.